When a coffee plant puts out its first few leaves and small branches, the coffee farmers of Maya Vinic call their plants “little soldiers”, and soldiers they most certainly are. In today’s global climate, coffee plants face a plethora of challenges and uncertainty. To go from seed to cherry, a plant must endure adverse soil conditions, potential drought, temperature extremes, and devastating disease. With every passing year, environmental and disease conditions are deteriorating, and coffee plants are having to fight harder than ever. Thankfully, the farmers of Maya Vinic have knowledge passed down from generations combined with the help of modernscience to strengthen their coffee plants through this fight. 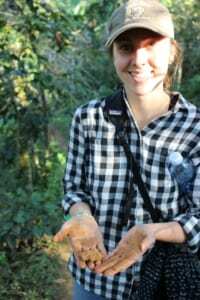 Farmers, in collaboration with professors and specialists in agronomy, are using principles of agroecology to create sustainable, resilient coffee systems that not only fight against poor climate conditions, but also work to restore and rejuvenate the environment. Modern agricultural practices of monoculture that rely heavily on chemical inputs are the source of many of today’s problems in both coffee and all of agriculture. The industry is slowly realizing that these practices won’t sustain the world’s coffee supply and will just make matters worse. Farmers are gradually going back to their roots, creating more natural farming systems. By working in harmony with the environment, and using organic practices, coffee farms have the potential to have their plants be not only good for the health of the planet, but also for the health of the farming communities and the consumer, a win-win situation. However, going back to these natural systems won’t happen overnight, and will take efforts from everyone involved, from the farmers to coffee roasters, all the way the consumer, to achieve. So what do these natural farming systems look like and how can they be accomplished? Due to the influence of industrial agriculture, many coffee farms around the world are unsustainable and struggling. Rows and rows of the same coffee tree are densely planted amongst soil that has been sterilized with chemical pesticides and herbicides. The soil lays exposed to water and wind erosion, and relies on chemical fertilizers for all of its nutrients. If there is an extremely hot day, or a period of prolonged drought, or heavy rains, these coffee plants lay vulnerable to nature’s elements, without trees and other organisms to provide protection and essential nutrients. In addition, a coffee farmer is also vulnerable to agricultural companies, relying on costly chemical inputs. If these practices continue, disease and temperature extremes are going to continue to decimate coffee farms, threatening the world’s coffee supply and degrading the environment. Now that we know what not to do, let’s talk about what we should do. The ideal coffee farm would not look like a farm at all, at least not what the modern world imagines what a “farm” looks like. This ideal coffee farm would look more like a tropical forest, with coffee plants interspersed amongst giant timber trees like Ceiba and Inga, and smaller fruit trees like bananas, mangoes and oranges, maybe even some chocolate trees. These trees would provide essential shade to protect from temperature extremes, fix nitrogen into the soil, as well as provide leaves that fall to the forest floor, providing essential nutrients as well as protecting the soil from wind and water erosion. This soil would also be teaming with billions of beneficial microorganisms from bacteria, to fungi, to worms and arachnids. I was lucky enough to witness firsthand how the coffee farmers of Maya Vinic, with the help of local agronomists, are currently working on various projects to create these beautiful, sustainable food forests. During my visit the “tecnicos”, a team of community members being trained in technical agricultural skills, put together a two day workshop in which they showed our group their projects. They showed us their bokashi composting, in which they combine coffee husk, fermented grass, ash, and honey. All of this is put into a canister and fermented for about a month. Afterwards its mixed with normal compost, creating a nutrient rich concoction. They also took us to their experimental field, and showed us their process of planting coffee. They dig a large hole about 30cm wide, fill it with fertile compost, and carefully put in the coffee plant. As a result, this plant will be will nourished for most of its life. Finally, they showed us their “Caldo rojo”, a broth of sulfur and calcium limestone used as a natural defense against coffee rust. These natural forms of fertilizer and disease control are helping farmers leave behind chemicals and restore natural, healthy ecosystems. So next time time you sit down with cup of Maya Vinic coffee, think not only about the dark, smoky rich flavors of the coffee bean, but how your cup is helping these “little soldiers” not only fight against climate change, but also restore and rejuvenate the land.